Succulent garden crops attract many insects, some of which are beneficial and either pollinate the blooms or feed on insects that threaten the produce. Some insect pests specialize and attack only one type of plant, but others devour any growing plants in the garden. Heavy infestations of grasshoppers denude fruit trees as well as vegetable crops and even chew the fiberglass screen from storm windows. Not every insect problem is easy to spot, because insects also attack roots below ground and even feed from within the plant itself. Caterpillars strip leaves from plants and eat holes in fruit. The best known include army caterpillars and cutworms, which attack young seedlings at ground level. The cabbage moth caterpillar feeds on any of the brassicas such as cabbage, kale and broccoli. The corn earworm riddles ears of ripening sweet corn, and the tomato hornworm can denude mature tomato plants in only a few days of heavy feeding. Beetles present several levels of threat to garden plants, since larvae as well as adults feed on vegetables and fruits. Tiny flea beetles riddle the leaves of potatoes and eggplant with small buckshot-sized holes. Both larval and adult Colorado potato beetles prefer the foliage of the potato plant. Japanese beetles feed on at least 275 different plants. Japanese beetle larvae hatch below ground and feed on grass roots, sometimes so heavily that large patches of lawn die out. Striped cucumber beetles attack squash, melons and cucumbers. Doing only minor damage physically, the striped cucumber beetles decimate cucurbits by transmitting diseases that stunt or kill the host crops. Aphids, mites and thrips may emerge in such large numbers that the bugs coat nearly the entire stem of an infested plant. Some species of thrips feed on tender plant tissue and cause cosmetic damage, lowering crop value, while other thrips prey on harmful insects. Aphids, mites and other sap-sucking insects may transmit diseases to the targeted plants and weaken their hosts by drawing off important nutrients. Affected plants often succumb to other problems. Larvae of the squash borer invade the main stems of cucurbits such as squash and melon, sometimes completely severing the stem from within. Plants may not be killed by these boring caterpillars but will be seriously set back. The larvae of this small beetle, the root weevil, lives underground and feeds on the roots of many common crops and ornamentals. Adult weevils feed above ground on the leaves of the same plants. The most commonly affected plants include the strawberry, raspberry and philodendron. True locust swarms occur rarely in North America and are now limited to northern Mexico and the American Southwest. 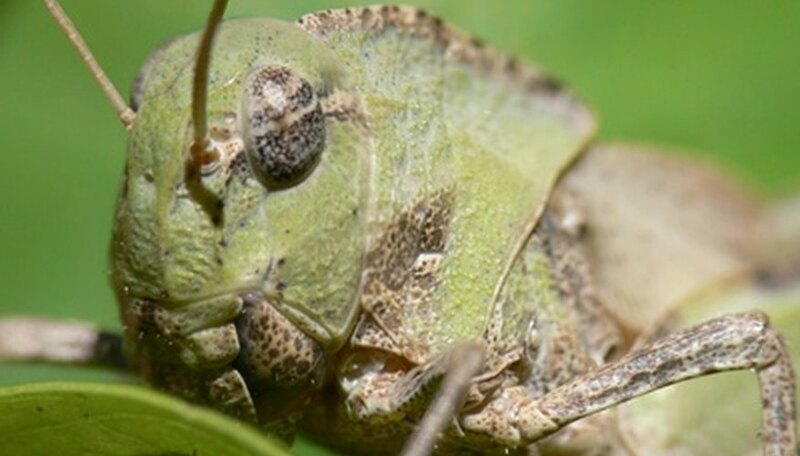 The common grasshopper's numerous species pose a continued threat, sometimes moving into gardens in large numbers after lawns are mowed or hay fields are cut. Grasshoppers of different sizes and appearances may not be different species, since the insect develops through several nymph cycles before reaching the reproductive adult stage.